Early childhood students are by their very nature creative beings. We nurture your child’s creativity at every turn, fostering a love of learning and the joy of discovery. Research has proven again and again that children in the early developmental stages of growth learn best when given the time and space to explore and play. Purposeful play helps children learn how to make decisions and choices. When your child spends time engaged in activities that he or she cares about, confidence and curiosity flourish. 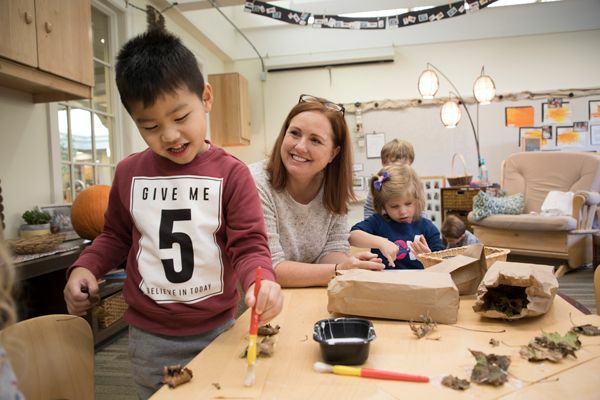 Hawken’s Early Childhood program allows your child to experience the joys of childhood while developing foundational knowledge, create and critical thinking skills, citizenship, and the habits of mind to support lifelong learning. Our approach to learning is tailored to the developmental needs and readiness of students in each level. In early childhood classrooms, the learning experience focuses on five domains of learning: social emotional, approaches to learning, language and literacy, cognitive, and physical. These domains encompass the core academic discipline, addressing each subject area from a developmental perspective, because each child progress at varying rates within each discipline.